It is that time of year again. The football season is fast approaching. We will be running a Footy Tipping competition for the football enthusiast. The cost will be $20 with all the cash going back to the winning tipsters. If you would like to take part please leave your name and $20 at the bar. The more the merrier. Local Vintage are performing again at the Dunsborough &Districts Country Club on March 24th 3.30pm – 6.30pm. BYO SNACKS. There will be no kitchen supplying food for this event. The Croquet Section will conduct Friday night twilight sessions during the summer months for those wanting to try this sport. Please have your names in courtside at 5.15pm for a 5.30pm start. The session will run until 6.30pm and is open to all. 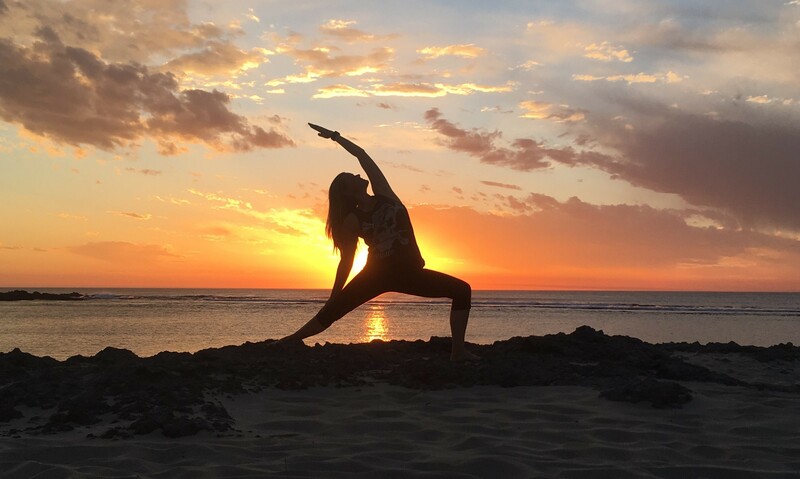 Mandy invites anyone who is interested to join this gentle and safe yoga practice, suitable for all levels including beginners and people over 50. * Please bring a blanket for relaxation (as well as your own yoga mat if you have one). PRESIDENT AND VICE PRESIDENTS TROPHY 6TH MARCH. Eighteen ladies played two games of triples for the President and Vice Presidents trophy. Runners up with 2 wins plus 18 shots up were Maureen Hines, Di Tas and Lorraine Bell. Winners with 2 wins and a massive 23 up were Gail Barry, Peg Howley and Lorraine Lewis. Fours Megan Black, Jill Winter, Jem Coupar and Christine Coyle. Wed 13th March will be social bowls. On Saturday the Golf Croquet players had a competion against Busselton, which they won narrowly. There was some great Croquet played with Ron Vincent and Alan Simmonds from Busselton being the best doubles players on the day, followed by Karen Martin and Brian Uren from Dunsborough a very close second, with the difference between them being only 1 hoop. A great day was had by all despite the rain. Congratulations to Raelene Willis who played in the AC doubles tournament at Bunbury Central on March 2ndand was runner up. This last weekend David Bell competed in the Div 3 Singles at Halls Head. David had a frustrating time and things didn’t go his way, but he won one game. Later this week 10 golf players, and some non playing partners, head off to Norfolk Island to compete in the Convict’s Cup Social Croquet Tournament. There will be 5 half days of croquet mixed in with tours and social gatherings. Each accommodation unit has their own vehicle. The speed limit is only 40kmh, and you have to give way to the cows! Hope you all have a wonderful time, and we look forward to your report for the newsletter. Runner Up was Barry Jackson with a score of 33 pts also. Paul Smith got thelongest Putton No 18. Maintaining his good form, Barry Jackson again came out winnerwith a good score of 36 points. With the rain during the week the course took on a tinge of green very quickly and the greens played truly. Mark will put the ticked names in for this event. Remember to Please check your name on the list and tick as necessary as ticked names must be sent in a week before the advertised Fixture . The Vets 2019 Fixture List is displayed in the Mens’ Golf Notice Board in the DDCC Reception area. · Bunnings Sausage Sizzle has been booked for Sunday 14 April. · Fixtures for 2019 for men and women will be drafted in the next couple of weeks. Receipts issued by them upon your payment. X Adventure Bike event to be staged . Golf manages the on course parking with a gold coin fee collection proceeds going to the Golf section and in the past has been a welcome boost to funds . Saturday Social Tennis has continued to be popular over the past few months, hosting both local and international visitors as well as an increased number of members. Captain Marlene and Mike Howes regularly organize the 25-minute mixed doubles sets with the help of a computer programme. Everyone is welcome and guaranteed good tennis mixed with fun and sportsmanship. Play starts at 1.00pm until wine o’clock at the bar but players are welcome to join anytime during the afternoon! Every Thursday from 8.30am (9.00am in cooler months). Thursday Ladies social tennis has become very popular, well attended and lots of fun. Weekly volunteers share the responsibility of organising the balls and 25 minute set play with Gwen, Nita, Mandy & Kirsty and other players ensuring every player gets plenty of court time. Play is from 8.30am during the warmer months but will soon become a 9.00am start which should suit those taking children to nearby schools. Over the summer, we hosted a number of short and long term visitors, some of whom have become good friends of the Club and plan to return next summer – including Sally and Jac from the UK, and others from nearby farming communities and Perth. Our pennant team (Marlene, Gwen, Nita, Julie, Fran, Helen, Dee, Jenny and Annie) currently stands undefeated in the South West Ladies Midweek Tennis competition. We wish the team every success leading up to the finals which will commence on 28th March at the Busselton Tennis Club. Hope you are enjoying the trails at the moment, they are riding really well. Thurs 5.30pm from Country Club, easy social ride beginners welcome. Volunteers will be required for X-Adventure which this year is on 30/31stof March. Similar format to last year. We need the bulk of the volunteers on Saturday between 1000 – 1700 but still need some on Sunday and Friday arvo/evening to help with registration. Can you please circulate to your members and they can e-mail directly back to me, John Jacoby,john@rapidascent.com.auwith name, mobile no., e-mail address and what days and times they are available. The Jackpot Draw was not won on Friday. The Jackpot total this week remains at $1000. Members must be financial for the 2018/19 membership year and present to claim the prize. The Jackpot is drawn between 5.30pm and 6.30pm in the Clubroom bar. Our first team in the Southwest League just failed to get into the finals of Division 1. They ended up fifth on the ladder, Mike Brown’s four beating Bunbury away while Gary Davies’ team lost on the next rink. The 3 points gained by winning the aggregate fell one point short of getting into the finals. In Division 3, our second side maintained their position at the top of the ladder when both Wayne Coyle’s and Tom Reynolds’ teams beat Bunbury at home. This earned them a place in the finals on 19th March. Also earning a place in the finals was our third side, when Don Henderson’s and Norman Gage’s fours beat Busselton at home, placing them second on the ladder in Division 4. 41 players rolled up on a pleasant day, including a few visitors, to take part in Rob Pollard’s peg-draw. The relatively newcomers to the club, Phil Higgins, Martin Osborne, and Gary Bell combined handsomely to win the day with 2 + 29. Some way back in second place where Hans Queckfeldt and Bevan Badger. The Mars bar was enjoyed by Terry South, new member John Lawson, and Toby McCarthy. Seven teams played four games and one bye on the 20th and 27th Feb in steamy weather. Three teams had three wins with Gail Barry, Sue Chester and Lorraine Bell just missing out on the runner up placement. Runners up with 3 wins and 15 up were Sharon Sharpe, Maureen Hines and Chris Coyle. the third player on day one and Estelle Perry on the second day. Wed 6th March the Ladies Chairman and Vice Chairman drawn pairs. Barry Jackson also got the longest Putt on No 18. Maintaining his good form, Barry Guest again came out winner with a good score of 37 points. John Crute adjusted well to the course to score 34 points and became Runner Up. Barry Jackson, Mal Williamson, Doug Macpherson, Jim Parry ,Paul Smith. The after game chat and refreshments was enjoyed by all . Well done fellas. We have put the leaf machine to work along the drains. Tuesday mornings is a good time for all who are available to assist even for a couple of hours. A Schools South West tournament (both public and private schools) was held at Bunbury Tennis Club on the weekend of 23/24 February 2019. Our coach, Paige Newhill, was extremely proud of the wonderful efforts and results of a number of her junior players. Winners in ‘A’ Grade were Holly Cucel, Tom Culley, Amelie Shanahan and Blayde Watts. There were also runners up from Dunsborough – among them – Matilda Anderson. Congratulations to you all, both on your results and your participation. We look forward to more of your successes. Volunteers will be required for X-Adventure which this year is on 30/31st of March. Can you please circulate to your members and they can e-mail directly back to me, John Jacoby, john@rapidascent.com.auwith name, mobile no., e-mail address and what days and times they are available. DUE TO UNFORESEEN CIRCUMSTANCES THIS EVENT HAS BEEN POSTPONED. Hear from the architects and interior design team and get a sneak peek at more detailed design plans. Your chance to ask any questions. With JDAP approval in November 2018, and design development finalised, we are progressing with contract documentation. Come and register your expression of Interest. Please forward this invitation to interested contacts and members of your club or organization. Our first side, playing in Division 1 of the Southwest League, were at home to Busselton Black. Mike Brown’s team went down by 6 shots, while Ed Homburg’s four were 4 shots up, earning the side a single point and placing them now fifth place on the 1st division ladder. Playing away at Busselton, our second side gained three points when Wayne Coyle’s team won by 18 shots while Tom Reynolds four lost by just 2 shots. Our second side thus retained its top place on the 3rd division ladder. In Division 4 Norm Gage’s four won by 10 shots away to Boyanup, while on the next rink Don Henderson’s team came down by 12 shots. A single point gained, meant that our third side dropped to third place on the 4th division ladder. There is just one more round to go this week in the Southwest League before the finalists are decided. A very pleasant day saw 48 participants in the peg-draw which Kevin Gibb ran as a three-bowl triples. Winners with 2 + 25 were Andre Gil, Phil Higgins, and Geoff Benn. Ralph Don, Tom Reynolds, and Brian Buttsworth were not far behind. Taking home the chocolate this week were Tom Ferguson, John Halden, and Trevor Palmer. On the noticeboard, please read a proposal for a revamped Pennants season next year as proposed recently by the Leeuwin League Men’s Committee, for consideration by all clubs, prior to the Leeuwin League AGM in May. Please indicate to your committee whether you are for against this proposal. On Friday the Croquet Section held their Presentation Dinner at the Club. Thirty five were present including special guests, Estelle Perry our main sponsor over many years, and DDCC Chairman John Halden and Amanda. Thank you to Terry Herd, MC for the night, and Raelene Willis for decorating the tables. Estelle and Lindsay sponsor the Association Croquet and Golf Croquet Singles events, Kate Speedy sponsored the AC Doubles, Jim’s First sponsored the Golf Doubles and players sponsored the novelty awards. The evening capped off a successful year for the DDCC Croquet Section both at home and in competitions at other clubs and Croquetwest Tournaments. A group of GC Players is shortly going to Norfolk Island to play Croquet. We know they will have a great time. We now look forward to an enjoyable 2019 croquet Season. Winner was Barry Jackson with a good score of 37 points on a countback. Barry also got the the longest Putt on No 18. Maintaining their good form, Barry and Doug again battled it out for the placings with Barry scoring 33 points to be the winner from Doug on 29 points. Laurie Richards scored a birdie to keep him in the action while Ron Carmody sank the long putt on No 18. With enough volunteers we can now also put the leaf machine to work along the drains. Tuesday morning 5 March, is our first effort. A good Combined Golf Committee was held last Thursday and included a short talk by Stuart Herbage on a possible fund raising exercise called Frisbee Golf which could be played on a Sunday. More details to follow . A Bunnings Sausage Sizzle has been booked for Sunday 14 April. Fixtures for 2019 for men and women will be drafted in the next couple of weeks. Can you please circulate to your members and they can e-mail directly back to me, John Jacoby, john@rapidascent.com.au with name, mobile no., e-mail address and what days and times they are available. 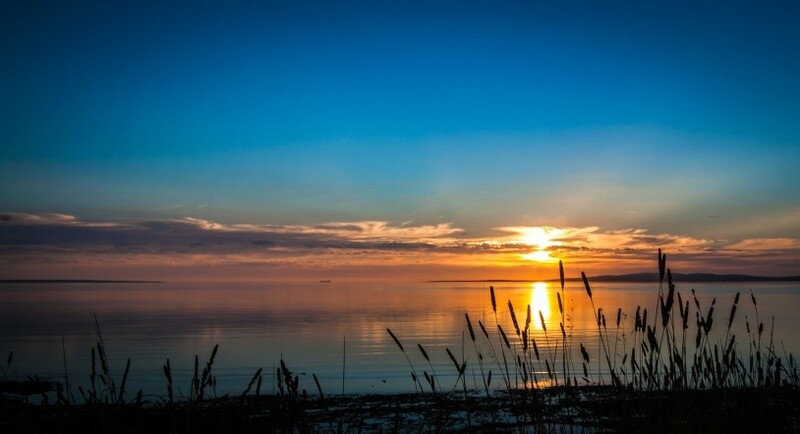 …..will be at the Dunsborough Country Club on Sunday the 24th February 3.30-6.30pm. Get a group together and come along and have some FUN!!! Grant Gladman is another of the wonderful volunteers who quietly goes about tidying and clearing leaves from the tennis courts and the surrounds and watering of the hundreds of plants around the tennis courts. Grant is an early bird and often around the courts soon after 6.00 am – quietly, because that is the way Grant operates. Like many of our volunteers his work is largely unseen but hugely appreciated by the Tennis Section. Our Tennis Coach, Paige Newhill, herself often coaching early in the morning can also be seen helping Grant in his watering duties. Thank you Grant – we hope you are able to continue your work to maintain the area. In the twelfth round of the Southwest League our first side earned 3.5 points at home when Mike Brown’s team tied with Capel’s four while Gary Davis’ team won by six shots. This leaves our first side in fourth position on the 1st division ladder. Away at Collie, Wayne Coyle and Thomas Reynold’s teams both won, earning them 4 points and keeping our second side top of the 3rd division ladder. Don Henderson’s team had an easy victory away at Binningup, while on the other rink Norm Gage’s four lost. However, the 3 points secured our third side their second place on the 4th division ladder. There was a good turnout of 41 players for Rob Pollard’s peg-draw. Champions on the day were Kevin Gibb and Wendell Hoover with 2 + 23, with Geoff Benn and Martin Osborne just five shots behind. Bevan Badger and Mick Finney took the chocolate. With both our first and second sides playing in the finals of the Leeuwin League, away at Margaret River, hopes were high that we would return with at least one trophy. However, our two second fours struggled all afternoon on the faster synthetics and lost on both rinks. The two dozen or so Dunsborough supporters enjoyed much closer games between our first team and Margaret River, Mike Brown’s four winning narrowly by two shots, while Dennis Frost’s team fell four shots short on the next rink, resulting in a Margaret River victory by just two shots. Over the weekend the Croquet Section held their AC Singles tournament. The eight participating players were divided into two blocks and within each block they played a round robin format of three 2 ½ hour matches. The winner of each block then played off in the final. David Bell was the eventual winner; the first time he has tasted success at this level. The runner-up was Raelene Willis. Congratulations to them both, and thank you to Captain, Raelene Willis, for organising the tournament. On Friday 22nd February the Croquet Section will hold their Presentation Dinner at the Country Club. The Club appreciates the support of our main sponsors, Lindsay and Estelle Perry, and Jim’s First. Do not forget combined Golf meeting Thursday 21st February at 10am. Our first team in the Southwest League were away at Eaton but lost on both rinks so are now fifth on the 1st division ladder. Our second team were at home to Collie Blue. Tom Reynold’s four were 9 shots up, enough to gain 3 points, despite Wayne Coyle’s rink losing by 5 shots. This enabled our second team to remain top of the 3rd division ladder. In the 4th division our third side gained just one point against Brunswick at home when Norman Gage’s team won by 1 shot on the last end, while Don Henderson’s four went down by 9 on the next rink. This leaves our third side second on the 4th division ladder. Numbers were down for the peg-draw as we had two fours at the Eaton carnival. 26 players enjoyed a pleasant day, Ralph Don and Bill Hitsert taking first prize with 2 + 12, which on a count-back saw the triple of Jim Holroyd, Greg Dixon, and Clive Williams, in second place. Hans Queckfeldt and Bill Pearce shared the chocolate. Dunsborough’s first division and second division teams were involved in the finals played at Margaret River on the weekend. On Saturday the first division team skippered by Mike Brown and Dennis Frost went down to Margaret River in the First Semi-final. They then played Cowaramup on Sunday in the preliminary final. Both rinks were evenly contested and it took a Mike Brown super shot to edge out Cowaramup on one rink which left Dennis Frost’s side to hold Cowaramup out to win the aggregate. Dunsborough now has a return match on Sunday against Margaret River. Plenty time to practice those short ends. The second division sides skippered by Bill Hitsert and Tom Reynolds had comfortable wins against Margaret River on Saturday and were again successful in the preliminary final against Augusta on Sunday. They now play Margaret River in the final. With only one more game to go, neither Dunsborough Teams are in a position to win. At Margaret River on Feb 5th Dunsborough White scored 1 !/2 points against Marg/Green, while Dunsborough Blue scored three points against Cowaramup. Marg/River Green are in top position with 52.5, and M.R. gold are second with 47. As nine players were away playing at the Inter League Round Robin in Pinjarra, only six women played a pairs competition. Winners for the day were Jean Kelly and Daisy Grist. Social bowls will be played Wed 13th Feb. This weekend, Saturday 16th and Sunday 17th February, the Croquet Section will be holding its Association Croquet Singles Competition on our courts. 8 players will play 3 two and a half hour games in two Blocks on Saturday. The Winners and Runners-up from each Block will play off for the final positions, playing 2 two and a half hour games. The Winner and Runner-up in the competition will be awarded their prizes on the Croquet Presentation Night at the Club on Friday 22nd February. Come along and support the players and learn more about AC. We start at 8.30 am and the games will finish around 4 pm on Saturday and 2 pm Sunday. In the Southwest League our first team played away at Collie and lost on both rinks, though retaining their third position on the 1st division ladder. Our second team played Capel at home, losing by 6 shots on Rob Prentice’s rink but with Tom Reynolds rink 20 shots up. The three points keeps our second team top of the 3rd division ladder. Playing away at Eaton, Don Henderson’s rink won by 8 shots while Norm Gage’s rink lost on the last end by a single shot. The three points leaves our third side second on the 4th division ladder, a single point behind Busselton. Just 28 players turned up for Rob Pollard’s peg-draw. Clive Williams partnered Geoff Oddy to win the day by 2 + 22, with Kevin Gibb and Johnny Tucker just 3 shots behind in second place. Steve Kristiansen and John Halden shared the Mars bars. Vets Winner T Reynolds defeated Kelly Allsop. Brilliant game 21/20. Many thanks to markers Jem Coupar, Janice Hoover, Sharon Sharpe and the men markers. Without their help we would not have events. Denise Mott and Gail Barry, and Dunsborough Blue,May Armstrong, Jem Coupar, Janice Hoover and Maureen Hines. the fours, so both teams scores 3 points. Duns Blue 36.5 and Cowaramup 18.5. After being cancelled due to inclement weather on 23rd Jan, the event was played on 30th Jan with 14 teams competing. Several players from visiting clubs featured in the winning teams. Fourth place was eagerly contested , with Ben and Di Tas, Don Henderson and Jenny Bruce having 2 wins +25 and 12 shots against, winning from Butch and Sharon Sharpe, Lorraine and Gary Bell 2 wins +25 and 11 shots against. Third place went to Merv and Denise Mott, Liz Wilson and Tom Walmsley winning 3 games +24. Second Jill and Graeme Winter, Cliff Dawson and Gail Barry won 3 games + 31. Winner for the day were Helen and Neville Stevens and Wayne and Chris Coyle winning 3 games + 46. Thanks to the sponsors William Barrett. A keen field took to the course to play our last game for January. Winner was Barry Guest with a good score of 31 points . Runner Up was Doug Macpherson with a score of 30 points. Returning to golf after a break, Mike King took out both Novelties with his longest putt and NTP. This was a good start for Mike and could well be a forerunner for the future. The future came sooner than expected for Mike King when he won the day with a score of 29 points. Well done Mike. Doug Macpherson was again Runner up . Jim Parry completed a good round with his Longest Putt on No 18. Mark has put the ticked names in for this event. Course cleanup is still in progress following the strong winds . There is still material which can be raked up into small piles on several fairways. Volunteers can make their own time to do this throughout the week with Tuesday mornings also being a good time for a combined effort. It’s surprising what can be done in an hour of raking . If we get enough volunteers we can now also put the leaf machine to work along the drains. Dunsborough Juniors Participated in the South West Zone Tournament on the weekend. Two long days just ask any one of the parents. From the smiling faces the junior players had a great time and did very well in the trophy department. Holly Braddock 12yrs under singles champion, Holly Cucel runner up 12yrs under singles and Holly Cucel with Holly Braddock doubles champion 12yrs. Samuel Siegrist and Max Foley 14 yrs under doubles runner up. Great day for Dunsborough tennis. Thankyou to all families for support. Adult Group Coaching is running Friday afternoons all welcome to come and try $15 for the hour. Hope you are enjoying the trails at the moment. Although a bit loose and slippery, they are riding really well. Check out Facebook Cape Mountain Bikers, or MRORCA for photos and results of the joint Summer Series downhill action being held on Thursday evenings. There has been an awesome 90 to 105 riders attending, with a good number of talented kids! Thusday social chatty MTB ride starting from the Country Club. Meet in the car park at 5.30pm. Bring cash for a drink afterwards. Just 33 players last Thursday for the peg-raw. Rob Prentice, Wendel Hoover, and Toby McCarthy took the meat with 2+21. Phil Higgins and Hans Queckfelt were just 3 shots behind in second place. Trevor Palmer and Clive Williams won the chocolate. Please note: The Men’s Novice and Vets Championship will be played this Sunday only. 3 days. The players played in one of 3 Blocks. The Winner and Runner-up in each block played in the finals on Saturday the 26th. The overall winner and now our latest golf champion is ERIC WATTS. Well done Eric. The Runner up was Barbara Miller hot on his trail, only 2 hoops behind. Although competitive, the games were played in great spirit and a good time was had by all. There were many very close games throughout the week showcasing the vast improvement of many of our players. The Tournament was a great success. Many thanks go to all those who helped. Strong winds and the aftermath of scattered leaves and some limbs did not deter the keen golfers for today’s golf. Barry Jackson played a steady game to score 29 points followed by Mal Williamson being Runner Up with 25 points. Barry kept his eye in to sink the longest Putt on No 18.
following their game on a summer day which saw Dunsborough beaches crowded . Following the strong winds the tractor and a small team of volunteers were put to good use to clear some of the leaf debris and limbs from several fairways. Volunteers can make their own time to do this throughout the week with Tuesday mornings also being a good time for a combined effort. It’s surprising what can be done in an hour of raking especially if you know where your shots are consistently landing!! Who knows, you may find one of your past lost balls! To TERRY HODGES for his continuing efforts in weekly maintenance of the tennis courts, the surrounds, the planting of some 400 PLANTS and staking of same (in very, very heavy soil) and constant weekly hand watering of same. Terry and his small team have been undertaking this work several times each week over the last 2 years. The tennis courts need sweeping at least twice weekly and the synthetic courts require hosing. Terry undertakes this work diligently and without fuss – his work is greatly appreciated and largely unseen. It’s quiet achievers like Terry that keep things running smoothly. CORPORATE BOWLS RECOMMENCES AT 6PM ON TUE 22 OR WED 23 JANUARY. ALL WELCOME – NO EXPERIENCE NECESSARY. PLAYED IN TEAMS OF 4 AND BOWLS PROVIDED. COST $8 PER NIGHT WHICH INCLUDES LIGHT REFRESHMENTS AFTER THE GAME AND GOOD PRIZES TO BE WON. THE GAMES ARE PLAYED OVER 6 WEEKS. REGISTRATION FORMS ARE AT THE BAR. TOWN KITCHEN will be providing dinner service Wednesday to Saturday. 14 teams enjoyed four games of 10 ends on Traders Day. First prize went to the wheat-belt farmers of country Tammin who won 4 games with 30 shots up. Our own team led by Geoff Benn came second, ahead of a Collie four in third place. Thanks were expressed to Estelle Perry, Gaye Gibb, Janice Hoover and Lorraine Lewis for assisting with the afternoon tea and to Jim Holroyd, of Jim’s First, who was also one of the sponsors of the day. Special mention must be made to Brian Morris for all his efforts in collecting Sponsorship for the event. The last, and 11th, round, before the finals of the Leeuwin League took place on a very hot day. At home, our first team, Dunsborough White, lost by just one shot on Mike Brown’s rink, which meant that though Dennis Frost’s four won easily, Dunsborough White earned just 3 of the 4 points on offer. This left them one point short of Margaret River White who took all 4 points at home to Margaret River Gold. Thus, the finals will take place at Margaret River again this year. Although our second team, Dunsborough Blue, lost on both rinks away at Augusta they earned 7th place on the single ladder, so will be involved in the second division final at Margaret River, while Dunsborough White will be challenging three other teams for the first division trophy. Our third team, Dunsborough Gold, came away with a single point at home to third placed Augusta Blue at home when Norman Gage’s rink beat Andrew Drayton’s by 2 shots on the last end. This placed Dunsborough Gold at tenth place on the ladder and therefore not eligible for the finals. Do read a letter from the Leeuwin League President, on the noticeboard, regarding next year’s Men’s Pennants. A decision will need to be made shortly about whether to continue with the single ladder, or to revert to the previous arrangement with two separate divisions and more games. Your committee would appreciate input from all our members so that our club’s view can be aired at the upcoming February Leeuwin League meeting. Jan 9th and Jan 16th. first day and two games on the 16th. reaching the winning score of 21.
for a score of 20/21. Liz Wilson and Gem Coupar played 29 ends in their game. Winning all five of her games saw Gail Barry becoming the Singles Champion. Winning four games were Helen Reynolds +43 , Liz Wilson +25 and Olive Jeanes +12. Wednesday 23rd will be the William Barrett mixed fours. The South West Ricochet Croquet Doubles Tournament was held at the club last weekend. 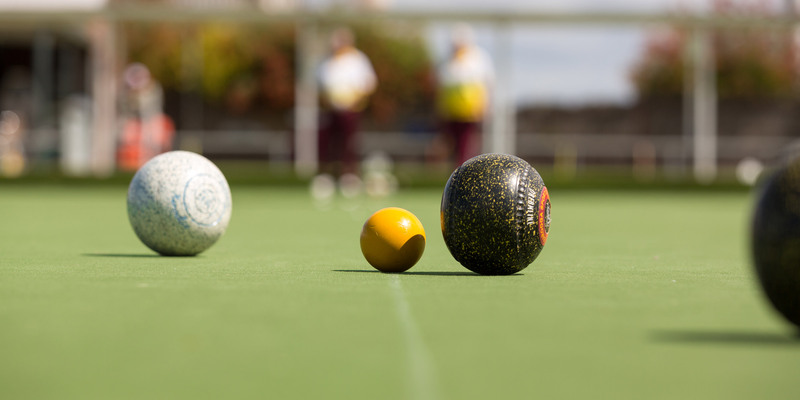 It is rare that players in the state have the opportunity to play in a Ricochet tournament and Dunsborough was chosen by Croquetwest because it is one of the few clubs which actively plays this format of Croquet. Ricochet was devised as a crossover game for Golf Croquet players who might want to play Association Croquet. It assists players in learning to position balls around the court to make multiple hoops. In the event, six Doubles teams played 5 x 1.5 hour matches each over 2 days; Kathy and Peter Hamilton from Como Croquet Club, Sheila Twine and David Smeeton from Halls Head, Dale and John Jury from Moorabinda, Raelene Willis and Tony Davies, Terry Herd and Richard Taylor, and Caryll Marshall and Max Kewish from Dunsborough. Handicaps of players varied from 1.5 to 20 and the skills levels varied from experienced players to complete novices. The hot weather was a challenge, yet all enjoyed the two days and a lot was learned by all. The winners were Dale and John Jury, the Runners-up Kathy and Peter Hamilton with Raelene Willis and Tony Davies third. The event was managed by our Ricochet Captain, Karen Martin and refereed by David Morris. Richard Taylor had a crash course in entering scores on the Croquetscores website. Caryll Marshall assisted with lunches. The “Green Team” produced a fast lawn. Thank you to all. A keen group of golfers took to the course for our mid week 14 Hole competition. Mal Williamson recovered his previous good form scoring 34 points to take out the honors for the day. Mal’s shots were crisp, direct and on line to make his putting spot on . Runner Up was Barry Jackson continuing his consistent good form to score 30 points. While the weather was hot a gentle sea breeze came in as we covered the course. It was a welcome back also to Mike King who recognized the course in its summer presentation and challenge. Doug Macpherson sank the longest Putt on No 18. For all those wishing to play in the Country Vets for 2019, your Annual Membership Fee of $20 is now due and should be paid to our Delegates ,Mark Embry, or Ron Carmody . First time new Members need to pay a $10 joining fee as well. The first fixture is at Capel on 4 February, 2019. 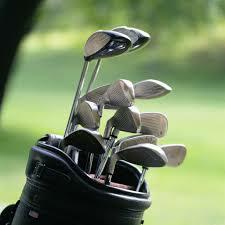 See fixtures on Golf Notices. DDCC Golf Notice Board is now located in the Entrance Area for all to view as necessary. Australia wide New Golf Rules now apply for all golfers. Check website . The DDCC Management Committee are seeking nominations for a vacancy. All nominations are to be presented to the Manager by the 16th January 2019 at 4.30pm. Nomination forms are available at the Club or can be emailed upon request. A BIG THANK YOU to Martin Osborn for the valuable time he has spent weeding the gardens at the Club. The garden looks fabulous and very refreshed without the weeds. Thank you Martin!! You are a wonderful volunteer who helps keep our great club ticking along. Four dozen bowlers turned up last Thursday making it easy for Rob Pollard to arrange a 4-2-4 contest. The day was won by Geoff Oddy and Heinz Fischer with 2 + 26, with Ken Hill and Rob Prentice in second place. Tom Ferguson and Peter Wilcocks enjoyed some chocolate. Welcome to all golfers and visitors for the 2019 year. With a good field of 14 on the course a keen competition took place with Mal Williamson scoring 31 points followed by Arnold Bosenberg on 30. Welcome was extended to Stuart Urbridge, Don Stewart ,Chris Esbray, and John Crute and Gary Boterhoven back down on holiday. Jim Parry also continues to hold his form sinking his putts with skill. Paul Smith took out the long putt on No 18 and Don Stewart showed the field how to get nearest the pin on No 10. Winner was Paul Smith back on course with a winning score of 33 points with some great shots . Mal Williamson continued his current good form with a score of 31. Well played guys. Williamson sunk the longest putt on No 18. Tuesday morning is a good course/ workshop project and you are welcome to join in and assist at any time. For all those wishing to play in the Country Vets for 2019, your Annual Membership Fee of $20 is now due and should be paid to our Delegate ,Mark Embry, or Ron Carmody , at least by 19 January. Thanks to the group of volunteers who have been maintaining the trails. With X Adventure approaching, we have a Trail Care Day this Sunday Jan 20th. If you have an hour or two to spare, please drop by the sea container on Chapman St at 8.45 am to be paired up to prune a section of trail. BYO gloves, we have rakes and tools. Note that the Cycle Club receives funds from hosting X Adventure, which go directly into our trails, and we would like them to look great! 39 bowlers turned up last Thursday to partake of John and Rob’s peg-draw. Winners on the day were Kurt Weir of Busselton with no little assistance from Geoff Benn, 2+23. Just unlucky, a shot behind in second place, were Phil Higgins and Ed Clarke of Brunswick. Brian Buttsworth and Hans Queckfelt drove home with the chocolate Bar. On 20th December croquet section held their annual Christmas gala day. The weather was perfect for the day. Juist over 30 croquet players turned up, some dressed up for Christmas and others came along and had a real fun time trying different strategies of croquet. There were lot of laughter, plenty of good fun completion, followed by a great Christmas buffet lunch. Many thanks to all the players who volunteered in setting up the courts, the table and decorations. A job well done. There were many individual prizes with Brian Uren taking out the Gala day Trophy, which he can hold for a year. Congratulations to all winners and not so lucky winners. Let’s do it all again next year. Summer golf is now in full swing with a rotating 14 Hole format and Handicap system set up where all regular and visiting golfers are welcome to participate on a Wednesday or Saturday. Ball fees for this format are $8 per player. Names in by 12.15 allowing a 12.30 Hit Off. Ball Fees for the proper 2019 Season are now $ 8 per financial member . Round 7 of the Summer Season saw Paul Smith win with a score of 30 points. Runner up was Terry Sanbrook on 29 points. Long Putt went to Roy Scott. With a good field of twelve players this was a good opener for the 2019 year. Winner was Gary Boterhoven with a winning score of 30 just pipping Mal Williamson on a countback. Well played BOTH. For all those wishing to play in the Country Vets for 2019, your Membership Fee of $20 is now due and should be paid to our Delegate ,Mark Embry at least by 19 January.